I specialize in positive reinforcement training, specifically, clicker training. I believe that the foundation of ANY good training is monitoring the horse’s mental and emotional state. If you treat a horse that is being naughty like it is scared or confused, your communication won’t work. However, similarly, if you treat a horse that is scared or confused like they’re being naughty, you’re going to create a lot of problems for that horse, and therefore, for yourself or someone like me. When you ask your horse bigger and harder when they are not in a mental or emotional place to be able to listen and understand, it’s the equivalent of yelling at someone in Spanish who only speaks German thinking that yelling louder will make them understand. If you yell louder, and get angry or frustrated that they don’t understand, odds are, they will just yell back. I see this play out metaphorically between horse and rider all the time. When I am having challenge with a horse, much of the time, this is the source. It is our job to do our best to understand and empathize with how our horse feels and to speak in a way that our horse can best understand, yelling louder usually isn’t the answer. How a horse responds to being treated like they are feeling differently than they are, depends on the horse. 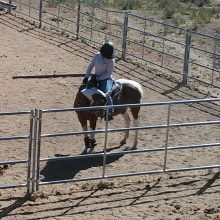 Ciara, our 6 year old APHA pony, used to respond by shutting down. She was so tuned out and “lazy” that it was nearly impossible to have any sort of interaction with her aside from standing still and possibly walking. The second she’d get scared or confused, she’d stop and couldn’t be moved. We have been together for two years now. We know each other quite well and trust each other, but we are certainly still growing, so run into challenges. Now that she has had what she considers fair treatment, being treated based on how she’s truly feeling, she does NOT tolerate unfair treatment. If she feels like you’re treating her unfairly, she is more than happy to buck you off, and she has bucked me off, several times. Mainly around cantering under saddle when MY dis-ease has caused me to treat her like she’s being naughty, when she was actually scared. Ciara has taught me an important lesson about myself and traditional horsemanship. Traditional horsemanship taught me that when things aren’t going right, try harder. Although this can be valuable advice for riding and life, I’ve found that I’ve reached a point in my horsemanship, as have many of my clients, where it gets me into trouble. Therefore, not only do I practice monitoring the horses mental and emotional space, I very carefully monitor my own. By watching my mental and emotional processes, I am slowly decreasing the number of unconscious responses in my work with horses and people that treat them unfairly. I wish I could say that I have eradicated such responses, but I think it will be a life long journey of decreasing them. The moment I feel that hardness inside my body, mind and heart, that grit, I’m learning to stop. Breathe. That hard, gritty feeling has become my clue that I’m probably treating a horse or person unfairly. The horse is probably trying to tell me how they’re feeling, and I’m ignoring them, I’m probably treating them like they’re being naughty or spoiled and they’re not. I am doing my best to become a soft, thoughtful and responsive human being, so that I can give horses the space to become soft, thoughtful and responsive horses. I don’t want to be a reactive person, and I don’t want a horse that is reactive to me. But how do we do this? How do we develop ourselves and our horses to be thoughtful? The number one key, I believe, is taking your time. Take it slow. Don’t rush yourself or your horse. Give yourself the appropriate time to grow and understand and give your horse the same. That means, when you’re asking your horse to do something, even as simple as following you one step. Take that step, ask your horse to follow, and if they don’t do it right away, give them a moment. Allow them the peaceful space to hear, listen, process and then respond. That’s easier said than done. We feel the pressure of making progress, only having so much time to work with our horses, etc. Perhaps that’s why taking things slowly, and being patient is the number one key, because it is the hardest one to achieve. Are you aware of your horse’s mental and emotional space when you’re working with them? When you have had a challenge with a horse, could it have been due to treating the horse unfairly by treating them like they were feeling differently than they were actually feeling? What’s your clue that you may be treating your horse unfairly? Do you make sure that you’re taking your time with your development and your horse’s development? Are you giving both yourself and your horse the peaceful space to evolve? I’ve given you a lot of questions to ponder, I’d love to hear from you about any challenges and successes you’ve had with monitoring your horse’s mental and emotional space, treating them fairly, monitoring your own mental and emotional space, as well as giving yourself and your horse the best chance to be soft, thoughtful and responsive.